The DC-9 was the first American--made short-haul passenger jetliner and remained alone in this market segment for a remarkably long time. The DC-9, which began commercial service in 1965, would be countered by Boeing with its 737 only over two years later (in April 1967). Therefore the main competitor for Douglas was the British-built BAC One-Eleven which had been already entered service. Douglas decided to install the two engines directly on the rear fuselage, an arrangement which was used for the first time in 1958 on the Sud Caravelle. This construction offers substantial aerodynamic advantages and improves handling if an engine should fail. 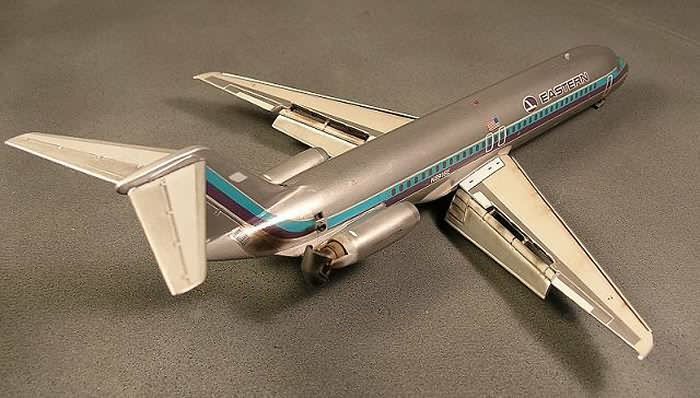 The original DC-9-10 was somewhat small with its original configuration designed for only 72 to 95 passengers and sales at first were rather disappointing. When the DC-9-30, stretched by 4,60 meters, completed its first flight in August 1966 demand picked up substantially. Specific requests for yet longer versions by SAS and the Swissair lead to further stretches. Altogether 976 copies of the DC-9 in different versions with from 72 to 125 seats have been delivered. That is a remarkable sales accomplishment. 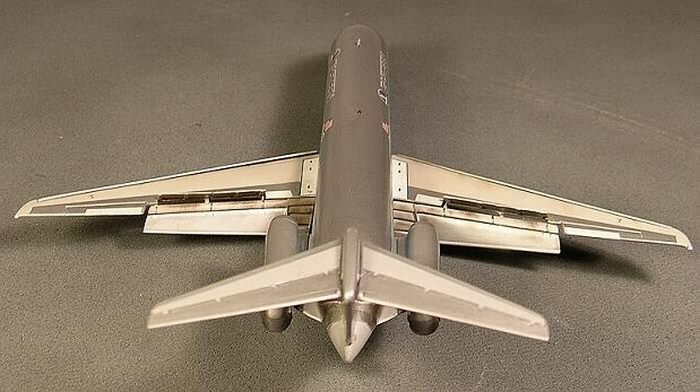 I started out with just the basic but classic Airfix DC-9-30. I wanted to build it with its engines in full reverse. After reviewing many photographs I began to build the kit. I knew I would have to modify the flaps, slats and spoilers on the wings. I first removed the flaps and spoilers from both of the wing halves. With the help of some styrene plastic I made the double slated flaps in landing configuration and replaced the kit spoilers with a scratchbuilt set in the deployed position. The JTD-8 engines were next to tackle from the kit. What I did was cut the rear of the cowlings off and made the "buckets" out of curved shaped styrene. I mounted the new reversers or "buckets" with very thin gauge strips of round plastic styrene. I also made some rock protector shields from scratch for the landing gear. 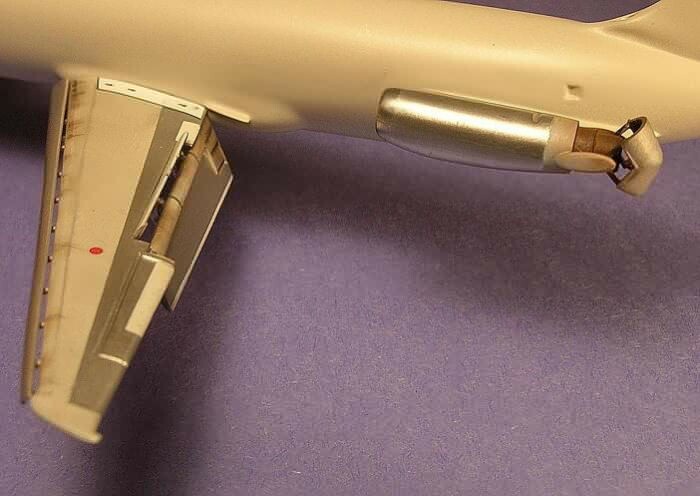 The painting of the kit was your basic Model Master aluminum buffing spray over an automotive primer base. 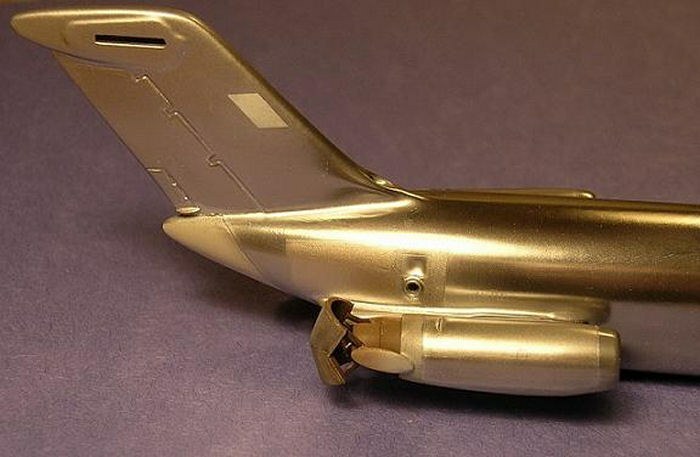 The wing and tailplane center sections were sprayed with a Tamiya USN light gray color. I used some SNJ powder on the leading edges of the wings and engines. To weather this old workhorse I used a Tamiya Weathering master kit. The Eastern Airline decals were stolen from an old Airfix/MPC DC-9.